It’s my one-year Invisalign anniversary! Happy anniversary to my now-straighter teeth. I thought I’d post an update here and a review of the treatment so far, in case anyone is thinking about doing Invisalign, too. First of all, let’s talk about the reasons why I decided on Invisalign. My teeth weren’t terribly misaligned from an aesthetic standpoint, at least not compared to some of the amazing before-and-after cases on the Invisalign website. One of my front teeth was crowded behind the others a little, and my back teeth were starting to tilt inward a bit. I had a fairly major over-jet though, and that bothered me from a profile perspective. Also, the misalignment was starting to cause some wear on my teeth, so the decision to undergo treatment was not only for my appearance but for the health of my teeth as well. My fantastic dentist referred me to an amazing orthodontist, who recommended Invisalign over traditional braces, though he said both would work for me and it was a matter of my own preference. I decided on Invisalign because I liked that I’d be able to take them out for special occasions, pictures, and situations where I’d be speaking in front of an audience. Invisalign requires fewer visits to the office, so there’s a time/convenience factor. I also liked the idea that the aligners were clear and therefore discrete. More on that in a moment. My treatment plan was designed for approximately 18 months, so I have about 5-6 months to go. However, depending on how my teeth track in this set of aligners, there’s always the possibility of an additional refinement period. A refinement period is another set of aligners to make additional adjustments after the initial set(s) of aligners are complete. After a year, I’m pretty used to the routine, but I’m also looking forward to being done. My least favorite thing is not being able to just relax after a nice meal or if I’m eating popcorn while watching a movie. I have to hop up immediately after I finish eating to brush my teeth and put the aligners back in. My second least favorite thing is that my set of aligners did not turn out to be as discrete as others (though I know it can be even worse, so I’m really not complaining). I am required to wear auxiliaries, or small rubber bands that hook from the top-front teeth to the bottom-back teeth to correct my overbite. Plus I do have several of the attachments, which are small tooth-colored buttons that are glued to the teeth to help the aligners fit better and in some cases to create specific movements for each tooth. They aren’t on my very front teeth, but they are on the sides and visible when I smile. Sometimes I am self-conscious of them, although people have said they aren’t noticeable unless I point it out. I don’t wear the elastics in public because those are definitely noticeable, but thankfully my progress doesn’t seem to be affected by not wearing the elastics 24/7. And I think the aligners only make me a tiny bit lispy. When I sing in the car it’s pretty terrible, but just in normal conversation I don’t have too much trouble. Other things to note: yes, it’s a little painful sometimes. The aligners, just like traditional metal braces, are designed to put a constant amount of pressure on your teeth, so of course there is some discomfort. It usually lasts the first few days of a new set of aligners and then you have several days where the teeth have already moved and now they are just being held in place. But the discomfort is not unbearable. I had regular braces when I was in elementary school, and I remember the tightening adjustments being more painful than the Invisalign. I got those braces off when I was eleven and I did not wear my retainer, (what eleven year-old has the discipline to wear a retainer?!) so here I am again. Would I recommend Invisalign? At this point I’d say absolutely YES! The progress so far is amazing, and I’m really happy with it. It has been super convenient, and I do love the fact that I can take them out when I need to. However, I would NOT recommend Invisalign if you don’t have the discipline to keep them in for the minimum amount of time each day, or if you feel like brushing your teeth 4-5 times a day would be inconvenient or embarrassing in public. I’ve brushed my teeth at the office, in restaurants, at the movie theater, in the car (safely, while stuck in traffic or parked), and even at the Verizon Center during a Capitals game! 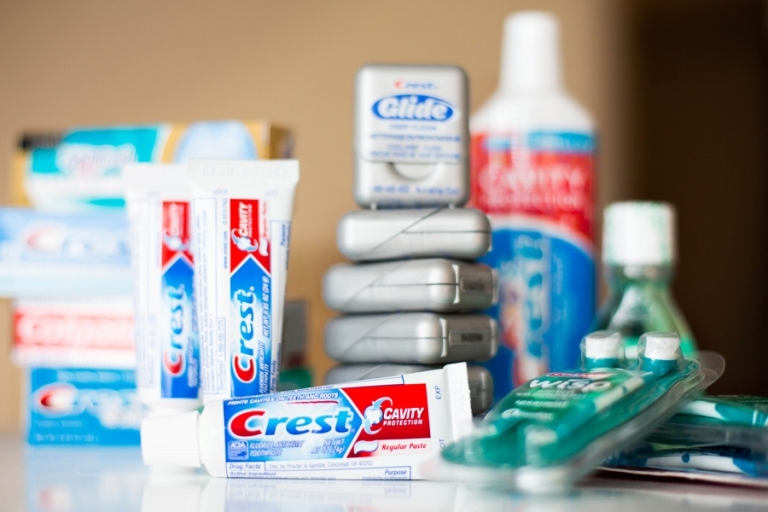 I constantly have a stockpile of dental supplies, especially in travel form, so that I can brush anywhere. I’ll post another update and before/after pictures when I’m all done, but if you have any questions in the meantime, please feel free to comment or email me! I’d be happy to chat with you about it, and if you’re local to the Northern Virginia area, I have THE most amazing orthodontist and I can’t recommend him enough!